Devotee Puhlo explained the reality of this world, and informed about the sufferings that one has to bear because of not doing bhakti. You are feeling so proud by attaining a small piece of land of a kingdom; this is futile. 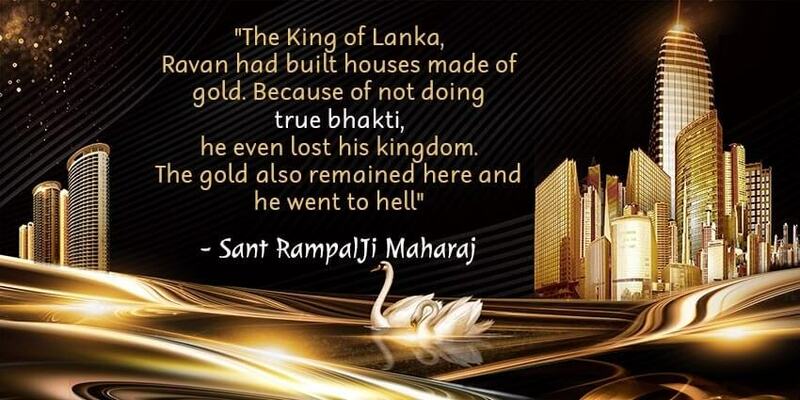 The King of Lanka, Ravan, had built houses made of gold. Because of not doing true bhakti, he even lost his kingdom. The gold also remained here and he went to hell. The king and the queens took initiation, did bhakti, and made their lives successful. Because of not doing the bhakti of God, a king acquires the body of a donkey. He carries mud in a potter’s house, and eats grass by himself going to a jungle. Meaning: - On completing the life of a donkey, that living being acquires the life of an ox. A living being has so many facilities in a human body. As soon as one feels hungry, one can eat food, drink milk or tea, or drink water if one is thirsty. Because of not doing bhakti, the same living being on becoming an ox roams in a jungle for 12 hours from morning till evening, and is used in a plough. An ox is fed only twice a day, at midday (12 pm) and at night. But if the ox feels hungry in between and the fodder is also kept all around him, he still cannot eat it. The ploughman does not let him eat the grass. Water is also given on time, only two or three times a day. The ox has horns on the head and a tail. When he was in a human body, he used to live in rooms with coolers, fans or A.C. in it. Now he only has a tail, whether he uses it as a cooler or a fan; he has to fly away mosquitoes with that alone. This was also mentioned in the satsang that the cause of discord at home is if a person because of not understanding the law of God follows the nature of the world. A member of the family does not want to cause any loss in the family. If due to some reason, a loss occurs, then one should not cause conflict because of it. Whatever loss had to occur has occurred. It cannot be set right. To cause futile discord is not wise. One should say to the person who has accidently caused a loss that – ‘O son/daughter/mother/father/mother-in-law/daughter-in-law! Whatever thing we have lost, it was not in our fate. You have not done it intentionally.’ By saying this, peace is maintained at home. Kaal resides in a discord. Ghosts and spirits reside in that house. Those who do not quarrel live happily. A house in which God is worshipped (prayer, ‘Jyoti Yagya’ – lighting a lamp is performed), gods reside in that house. Nisha was thinking that – “She will tell it to my husband. After listening to his mother, he does not listen to me. He will scold me. The entire day and night will go in crying.” Putting the milk in the bucket, Nisha fed it to the buffalo, and then washed the bucket. Bhateri came and said, “Daughter! Have food. Do not worry. Daughter! Yesterday, I had gone to satsang in the daytime with my sister Dayakaur. My eyes have opened. I had become very quarrelsome. Daughter, if possible, forgive me. Whatever has happened so far, let it be, but from now on, I will give all my love to my daughter. You are my real daughter. My biological daughter was someone else’s; she went away. We share the same joys and sorrows. Only one day of satsang has opened my eyes. Daughter! You may also come along next Sunday; I will also go. Gradually, we will take my son too.” Nisha had hid her Guru ji’s photograph in the clothes. Taking the photograph out, she kept her head in Guru ji’s feet and said, “O Guruvar! Today you have listened to my prayers. You have turned my home into heaven.” When Chattar Singh arrived in the evening, his mother did not even mention about the spillage of milk. After a few days, she got Chattar Singh initiated as well. After some time, Nisha’s Guru ji came. Nisha told him, “Guru ji! My mother-in-law is very nice. She has also taken initiation from a Guru.” Bhateri said, “Maharaj ji! Nisha never told me that she has already taken initiation. She must be frightened of my strife. She has told me now when I have taken initiation. She did the right thing. If she had told me earlier, I would have tortured her more, and would have incurred sin.” Nisha’s Guru ji said, “Mother Bhateri! You have come out of the frying pan into the fire because your spiritual instruction is not according to the scriptures. Without true way of worship, salvation is not possible. Like, only after taking a correct medicine, a disease is cured. Similarly, by following the true way of worship, one gets freedom from the disease of birth and death.” Nisha thought that mother-in-law might get annoyed. Therefore, she interrupted and said, “Guru ji! I have heard that you have written a new book. The congregation has got it published. Do you have it with you?” Guru ji said, “O daughter! I have come to give it to you.” On saying this, Guru ji went into another room where he was staying. There was a bag kept there. Nisha also went inside with him, and said, “Gurudev! Do not touch the beehive. It has calmed down with great difficulty.” Guru ji said, “O daughter! Now your mother-in-law has full interest in bhakti. Now she will accept it.” Guru ji stayed for three days; explained tatvgyan (true spiritual knowledge). Bhateri also changed her guru and got her welfare done. The house turned into heaven by satsang. There was peace everywhere. Where bombs of abuses were released all day long, now the ganga of the knowledge of God started flowing there. Nisha’s Guru Ji was Supreme God Kabir Ji who used to wander in a different attire to propagate the true way of worship (bhakti). He told which God should be worshipped? Read further amongst other topics. Meaning: - For example, a well with a Persian wheel has an iron wheel on which buckets are welded. In olden days, it was driven by oxen and camels just as a traditional oil mill is driven by oxen or camels (it was more prevalent in the olden days). The bucket of the Persian wheel scoops water from deep inside the well. It becomes empty on the top. This cycle goes on forever. Similarly, one fills up a bucket with sins and merits from this earth-like well and empties in the heaven and hell above. In this way, a soul remains in the cycle of birth and death foreve. This very thing has been explained in the above hymn that abandoning the family and the wealth in the world, one day you will depart alone. Then on taking birth in a different place, by performing the same action, you will depart again. If you go to another city from your home, before you depart you make sure that – “We will go there. After that we will take rest there.” But on leaving the world, you never think where you will take rest. O soul! You undergo torture in the births of eighty-four lakh types of living beings. You take birth (attain the life of a new creature) and die. Sometimes you are designated to the upper-class by becoming a king, and sometimes when you become a pauper, you are considered to be of lower-class. God Kabir is explaining that even the incarnations (Ram, Krishna etc) because of not getting the true way of worship are in the cycle of birth and death. The true way of worship is available with me. O living being! Recognise me. I am the Omnipotent God. I will end all the hassle of your birth and death. Meaning: - God Kabir has stated that – “O innocent human being (man/woman)! Recite the (naam) mantra of God, and perform auspicious deeds. Who knows what tragedy may take place tomorrow, that is, in future. We do not even know about a single second. One cannot accumulate wealth without deceit. Then one also spends some money out of it in meritorious deeds. Thus, one ties two bundles of sins and virtues. How will these become light? One bears the sins in hell and the virtues in heaven. Mother-father, brother-wife etc relatives think of things relevant to them. They have become associated with us in the form of a family due to the previous births. Whoever’s time will come to an end, whoever’s dealings with others will finish, he/she will immediately depart (die) from the family. Like, a compartment is full in a train. Wherever’s ticket one has taken, one gets down there. This family is like a compartment of a train. After death, this body turns into soil. At that time, none of the family members would be your companion. A man used to love his wife a lot. When he grew old, his death was near. He said to his wife, “Will you come with me?” She instantly declined, “No, I will not die with you. I am three years younger to you.” The old man was shocked that day. He stopped talking to her. Whenever she used to come near him, he used to turn his face away. He did not use to say anything. After 60 years of companionship, for the first time that old man felt that nobody belongs to anyone. If that old woman had some sense and really loved him, then she would have said, “Take me also with you.” The old man was not going take her with him anyway. He would have at least become pleased. He would have died peacefully. Who could have killed the old woman before her time? This proves that the real love is a long shot. Everybody is linked to you due to self-interest. O human being! Due to the (jap) recitation of mantra, (tap) penance and the meritorious deeds performed in the previous birth, you are getting fame in the present life by becoming a minister, prime minister or a high official, just as a moon enjoys glory in the midst of all the stars at night. If you do not listen to the viewpoints of satsang, then without the knowledge of the soul, by not doing bhakti of God, you will eat faeces on becoming a dog in the future birth. Now you talk about your power, that is, physical strength and power of position, but in future you will suffer badly after becoming an animal. In this world, your life is similar to a dew drop which is shining on the grass in the morning and disappears after some time. Therefore, by taking Satnaam, that is, True Mantra from a Complete Satguru, do bhakti and get the welfare of your soul done. Apart from the true scripture-based mantra of bhakti, all others religious practices that are against the scriptures are like the mud of swamp. Instead of taking one out, they make one drown even more. The true way of worship was with Supreme God Kabir, and Supreme God Kabir only had told it to a few other saints, but He had forbidden them to tell it to anyone else. Currently (from 1997), that way of worship is available with me (Rampal Das). Apart from me, no other saint or guru has the mantras of bhakti that have been proven in our scriptures. Come and take initiation, and make your and your family’s life successful. If you took initiation from a saint or guru of any other sect, then it would be like jumping out of a frying pan into the fire. You will neither belong to the house nor the riverside. Earlier I (author) used to deliver satsang in every village. People used to listen to my satsang that shakes one’s soul, but they did not use to take initiation from me. They used to take initiation from other saints. They did not get any benefit from there. They became happy after taking initiation from me. The conclusion of the above mentioned statements of satsang is that if one gets to listen to the viewpoints of satsang, then a home becomes heaven. Without it, one has to lead a hell-like life. In this way, the welfare of the world is possible. Everyone can attain salvation by leading their life with love and affection. This is very important.